Ed Sheeran has opened up the Swansea stage at BBC Music's Biggest Weekend, before rushing off to play his own show in Manchester tonight.The star took to the stage shortly after midday, playing Castle On The Hill to an estimate 52,000 people. "Thank you so much for turning up so early," he said. "A part of me thought no-one would be here. "The festival takes place in three locations on Saturday - with Perth and Belfast also hosting stages.Noel Gallagher, Sam Smith and Underworld are headlining, with full coverage on BBC TV, radio and online. 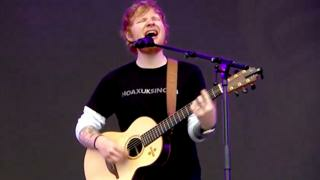 Sheeran played his set solo - looping his guitar and voice using an effects pedal to create a one-man pop symphony. "What my job is, is to basically warm you up a little bit," he told the audience. "Even if you don't know the words, make them up. "You have to sing something. "He didn't need to worry. The crowd, much younger than a normal festival audience, knew songs like Bloodstream, The A-Team and Shape Of You off by heart (although quite a few were still queuing for lunch when Sheeran hit the stage).The skies opened as his set ended, with rain and thunderstorms forecast to descend on Singleton Park for the rest of the day.Sheeran, however, will escape on a private jet to make his headline show at Manchester's Etihad stadium later.Speaking to Radio 1's Newsbeat, he addressed the ticketing situation on his UK tour - which has seen fans who bought tickets on the secondary market having them invalidated, and being told they had to buy new ones. "I'm not trying to stitch fans up," he said, explaining that fans will get refunds, and are being offered replacement genuine tickets at face value. "The only people it is going to harm in the end is the touts," he explained. 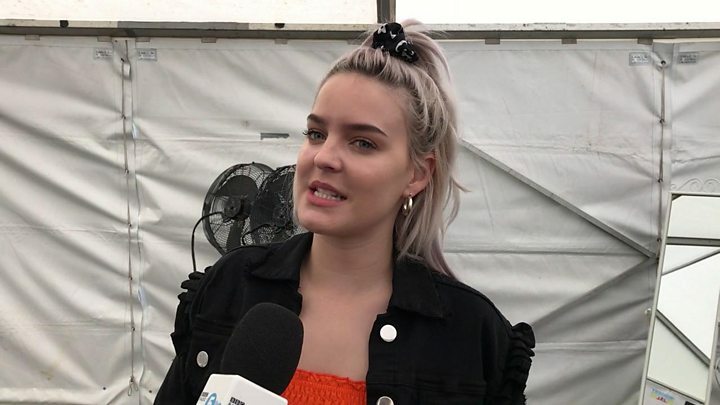 His support act, Anne-Marie is also on the bill in Swansea - and told BBC News they'd had to hire private jets to make sure they could play both shows.After their sets, fans will be treated to performances from George Ezra, Jess Glynne, Anne-Marie, Not3s, Mabel and Chvrches.Belfast's line-up includes Neneh Cherry and Ash, while Perth's Scone Castle will see sets from Emeli Sande, Simple Minds and Amy McDonald.